Particle physics is a branch of physics which studies the nature of particles that are the constituents of what is usually referred to as matter and radiation. In current understanding, particles are excitations of quantum fields and interact following their dynamics. Although the word "particle" can be used in reference to many objects (e.g. a proton, a gas particle, or even household dust), the term "particle physics" usually refers to the study of "smallest" particles and the fundamental fields that must be defined in order to explain the observed particles. These cannot be defined by a combination of other fundamental fields. The current set of fundamental fields and their dynamics are summarized in a theory called the Standard Model, therefore particle physics is largely the study of the Standard Model's particle content and its possible extensions, with the recent finding of Higgs boson. Modern particle physics research is focused on subatomic particles, including atomic constituents such as electrons, protons, and neutrons (protons and neutrons are composite particles called baryons, made of quarks), produced by radioactive and scattering processes, such as photons, neutrinos, and muons, as well as a wide range of exotic particles. Dynamics of particles is also governed by quantum mechanics; they exhibit wave–particle duality, displaying particle-like behavior under certain experimental conditions and wave-like behavior in others. In more technical terms, they are described by quantum state vectors in a Hilbert space, which is also treated in quantum field theory. Following the convention of particle physicists, the term elementary particles is applied to those particles that are, according to current understanding, presumed to be indivisible and not composed of other particles. All particles, and their interactions observed to date, can be described almost entirely by a quantum field theory called the Standard Model. The Standard Model, as currently formulated, has 61 elementary particles. Those elementary particles can combine to form composite particles, accounting for the hundreds of other species of particles that have been discovered since the 1960s. The Standard Model has been found to agree with almost all the experimental tests conducted to date. However, most particle physicists believe that it is an incomplete description of nature, and that a more fundamental theory awaits discovery (See Theory of Everything). In recent years, measurements of neutrino mass have provided the first experimental deviations from the Standard Model. The current state of the classification of all elementary particles is explained by the Standard Model. It describes the strong, weak, and electromagnetic fundamental interactions, using mediating gauge bosons. The species of gauge bosons are the gluons, W−, W+ and Z bosons, and the photons. The Standard Model also contains 24 fundamental particles, (12 particles and their associated anti-particles), which are the constituents of all matter. Finally, the Standard Model also predicted the existence of a type of boson known as the Higgs boson. Early in the morning on 4 July 2012, physicists with the Large Hadron Collider at CERN announced they have found a new particle that behaves similarly to what is expected from the Higgs boson. In early October 2014 the LHC discovered a new particle that was found to have four quarks, named the tetraquark. ^ a b Braibant, S.; Giacomelli, G.; Spurio, M. (2009). Particles and Fundamental Interactions: An Introduction to Particle Physics. ^ "Fundamentals of Physics and Nuclear Physics" (PDF). Retrieved 21 July 2012. ^ Nakamura, K (1 July 2010). "Review of Particle Physics". Journal of Physics G: Nuclear and Particle Physics 37 (7A): 075021. ^ Mann, Adam (28 March 2013). 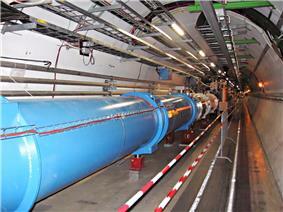 "Newly Discovered Particle Appears to Be Long-Awaited Higgs Boson - Wired Science". Wired.com. Retrieved 6 February 2014. ^ "VEPP-2M collider complex" (in Русский). Inp.nsk.su. Retrieved 21 July 2012. ^ "Germany's largest accelerator centre – Deutsches Elektronen-Synchrotron DESY". Desy.de. Retrieved 23 June 2012. ^ "Kek | High Energy Accelerator Research Organization". Legacy.kek.jp. Retrieved 23 June 2012. ^ "Universe Today; Benefits to Society". Universe Today. Retrieved 8 October 2014. Ford, Kenneth W. (2005). The Quantum World. Oerter, Robert (2006). The Theory of Almost Everything: The Standard Model, the Unsung Triumph of Modern Physics. Schumm, Bruce A. (2004). Deep Down Things: The Breathtaking Beauty of Particle Physics. Povh, Bogdan (1995). Particles and Nuclei: An Introduction to the Physical Concepts. Springer-Verlag. Boyarkin, Oleg (2011). Advanced Particle Physics Two-Volume Set. CRC Press.